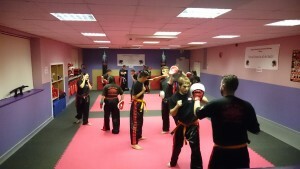 Our Kickboxing class is open to adults and young adults aged 13 and over. The class is a superb way to improve you fitness, flexibility and confidence whilst the learning and enhancing new skills. You won’t find the monotony of the gym here! Our classes are taught in a safe and friendly environment with men and women of all ages and abilities – new people start all the time and there is no need to worry about your current level of fitness or ability as you will be encouraged to progress at your own pace. We cover self defence techniques too and if you wish you can participate in sparring and even enter competitions – although this is optional. Take the first step, book a free trial and just give it a try!